There are some dolls you see photos of at the beginning and you immediately love them. This has happened to me on a few occasions, namely Pullip Nana-Chan & Kiyomi, Blythe Curly Blue Babe & Bianca Pearl and then… this My Melody Blythe. 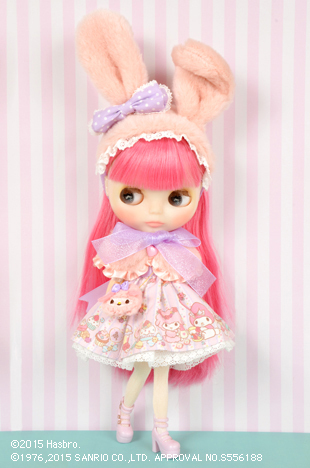 My Melody Blythe, slated for release in the Japanese Fall. I completely fell in love with her. She might be a Japanese exclusive, and currently priced at 26,500円 (Yikes!). More pictures and a midget review of Blackberry after the break!